Sean Kingston is seen here at his luxurious home studio in South Florida shouting out ZShock. This is the very home he filmed his MTV Cribs episode. Sean Kingston is the newest member of Team ZShock, he is seen here sporting the rare 25 year anniversary G-Shock with a solid gold and diamond ice head bezel by ZShock. Sean is grinding hard and at the time of this post had the #5 song in the country with Fire Burning. Another major player is seen here keeping and iced out G-Shock by ZShock in his collection. Get at us, www.ZShock.com . ZShock met up with our boy Rich Hil on South Beach in Miami while he was in town recording. Let's get business outta the way first. Rich is seen here rockin his Blacked out G-Shock 5600 series that was iced out by ZShock exclusively for him as a matching accessory to his new Blacked out Range Rover, the ride and watch are mad crazy. Rich has a musical style that we have not seen, infectious tunes and the way he rides the beats are even more seering to your brain. You can't help but listen to the essence of his lyrics. ZShock is a big supporter of Rich Hil, so when he drops his first album, we will be telling you to go cop it. For now, go download his mixtapes at http://www.nolimos.com/. Another Team ZShock memeber....everyone knows that Chris Brown is a big G-Shock fan. Chris stepped up his G-Shock game and now owns a few iced out G-Shocks that were custom made by ZShock. Chris was so impressed he made this video himself and e-mailed to us to show his appreciation. C Breezy in the house! Another example of a clebrity that keeps an icee G-Shock in his collection. Get at us! Bow Wow, known for rockin the newest and hottest gear out turned to ZShock for his newest bauble in his collection. Bow Wow's Diamond G-Shock is a military series 6900 with a reverse dial and an iced out Bezel that is sure to be blazing and seen for a long distance away. Don't sleep on Bow, he is constantly grinding out the jams and now hell be stunting even harder with his ZShock. Bow is yet another baller that shows us you must maintain an iced out G-Shock in your collection. R and B singer Mario is seen here on BET's 106 and Park Co-hosting and getting his ZShock on with his custom canary diamond G-Shock by ZShock. Mario told ZShock the watch is crazy and he gets nothing but compliments when he wears it. You too can get your Shock on, with ZShock. When the creator of one of the hottest underground clothing companies, Flipelican Clothing, is a G-Shocker and wants to take his Shock to the next level, you know he turns to ZShock. Well, that's exactly what Nino Brown did. Watch as he explains which of his ZShocks is his prized possession. Another reason why real ballers keep an iced out G-Shock in their collection. Multi-talented and beautiful Teyana Taylor is known for her style and fashion sense. She loves to rock the latest and greatest in fashion. She is also a known G-Shocker. Who does she turn to to "Rock" out her G-Shocks in ice. ZShock of course. Teyana is seen here with a ZShock Vixen hot pink Baby-G. All fashion conscious girls know to keep an iced out G-Shock by ZShock in their collection. John Legend is seen here wearing his blacked out diamond G-Shock while he is performing in concert. John loves black and when he saw hi watch, he took off the Audemaurs Piguet that he normally wears and slapped on his ZShock. Needless to say he was psyched and he rocked it while rockin the crowd. Another display of boys who know their toys keep an iced out G-Shock in their collection. Lil Wayne Spotted ZShockin in Miami? 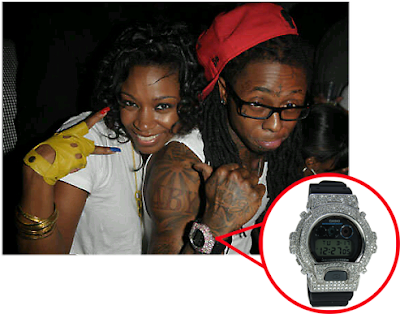 Lil Wayne, Mr. Weezy himself, was spotted in Miami recently at the D. Woods birthday party sporting an iced out G-Shock. The ZShock movement is afoot. Another piece of evidence that ballers keep an iced out G-Shock in their collection. R&B Singer MARIO Barrett is a ZShock fan and customer. Watch his video here where he shows love for ZShock and shows you the sick, tricked out G-Shock by ZShock. MARIO's canary diamond iced out G-Shock was custom made by ZShock, it has almost 8 carats of matched canary diamonds all set in a blacked out metal bezel. Watch for MARIO's new album to drop soon. Another celebrity who loves his toys, chooses a customized G-Shock by ZShock as the watch to keep in his jewlery wardrobe. Amber Rose Be G-Shockin, too Sweet! Peep this recent shot of Ms. Amber Rose with her fine-ness. She is casualled out to the max but yet she looks fresh to death. The beauty is in all the details, right down to the G-Shock on her wrist that matches her leggings and her hair. Can you say, "Hello"? Look for Ms. Amber Rose to be sportin an iced out G-Shock by ZShock soon enough.